Arimaa is a board game, invented around 2002 by Aamir Syed and Omar Syed. The game can be played on a standard chess board, using four markers for special "trap" squares, with standard chess pieces, but one can also buy commercial sets with the pieces replaced by nice looking animals. Arimaa has its own website: arimaa.com. Also, a book on the strategy of the game has been published (I saw it for sale at amazon.de for 13.99 euro): Beginning Arimaa by Fritz Juhnke. The game is designed to be hard to play for computers. Indeed, the inventors offer a 10.000 dollar prize for a program that wins from human players, in a match of nine games: three games against each of three human players. So far, the best the computers came was a 6-3 for the humans in 2010. For more on this challenge, see the arimaa website. The game is played on an eight by eight chess board, that is initially empty. For squares are specially marked with traps: c3, c6, f3 and f6. Each player has sixteen pieces: an elephant (king), a camel (queen), two horses (rooks), two dogs (bishops), two cats (knights) and eight rabbits (pawns). The pieces have the following strengths: the elephant is the strongest, then the camel, then the horse, then the dog, then the cat, and finally the rabbits. The game starts with one player (gold, or white) making a setup of his pieces on his first two rows. Then the other player (silver, or black) makes a setup of his pieces on the two first rows at his side. Any arrangement is allowed in these two rows. The players alternately make a turn, with gold starting to move. In a turn, a player can make four movements. Each movement moves a piece in an' orthogonal direction: sideways, straight forward, or straight backward. It is allowed to move different pieces, or make all four movements with the same piece, and also change directions after each movement. It is allowed to make fewer than four movements, but one must make at least one movement. There is one additional restriction: rabbits cannot move backwards. One does not take pieces like in usual chess. Instead, pieces are pushed and pulled. A piece can push or pull a piece of the opponent that is weaker, so a dog can only push or pull cats and rabbits. To push, first move your (stronger) piece to one of the empty squares that are orthogonally adjacent to the piece of the opponent, and then move your piece to the position of the opponents piece; the opponents piece is pushed in the same direction one square. To pull, again first move your piece to an empty square incident to the weaker piece of the opponent, then move away from that square, and put the piece of the opponent in the vacated square. A push or a pull takes two movements (i.e., two of the four parts of a turn), and must all be done in the same turn. It is allowed to combine pushing and pulling in a turn; however, with one movement, one cannot push and pull simultaneously. A piece that is ortogonally incident to a stronger piece of the opponent is considered to be frozen: it cannot be moved by its owner. There is an exception: if there is a friendly piece ortogonally incident to it, it is not frozen, and thus can be moved by the owner. A player can win by moving a rabbit to the other side of the board, i.e., to any square on the last row. If a turn is ended, and the moving player has a rabbit on the last row he wins. Otherwise, if his opponent has a rabbit on his last row, then the opponent wins. Otherwise, if the opponent lost all his rabbits, the opponent loses. Otherwise, if the player has lost all his rabbits, the player loses. Otherwise, if the opponent has no possible move or all moves create a repetition of a move for the third time, the opponent loses. Otherwise, the game continues with the next move. A piece that is on a trap square is removed from the game unless there is a friendly piece ortogonally incident to it. It is possible to move into a trap square while pulling or pushing, and be removed from the game simultaneously. It is illegal to move such that a board position and side to move would occur for a third time; if this is the only possible move, then the player has lost. Also, a player without any legal moves loses the game. In addition, a player without rabbits loses the game. Like Bombalot, Arimaa is a variant that's very unlike chess, in that there are no matable kings, but it can make use of standard chess equipment. Arimaa might have spread over-the-board better were it not for the licensing requirements for e.g. literature or running tournaments. It's perhaps too bad world championship level human Arimaa players finally lost in a challenge series vs. a bot (engine) in 2015.
http://www.chessvariants.org/index/mainquery.php?type=Any&category=Usual-MultiMove∨derby=LinkText&displayauthor=1&displayinventor=1&usethisheading=Multiple+Move+Variants. Daniil Frolov has the right idea, and his referencing 007 Chess actually has to do with Arimaa. That is, what gives arimaa its 15,000 or so average alternative moves per turn comes from the plural moving each turn. Just find suitable multi-move CVs from above index, and those CVs arguably present the same difficulty for Computer as arimaa; research can then find which ones actually do. Approximation of how many moves are available in some sample CVs from multi-move category is instructive. Argument can also develop two other ways: (1) use CVs only from Progressive sub-category; (2) Apply Mutator of requiring up to four moves per turn on any CVs having mostly short-range piece-types, as Frolov is implying in mention at 007 Chess. Patent proceedings are supposed to be conducted with the utmost decorum and integrity in any country. http://patft.uspto.gov/netacgi/nph-Parser?Sect1=PTO1&Sect2=HITOFF&d=PALL&p=1&u=%2Fnetahtml%2FPTO%2Fsrchnum.htm&r=1&f=G&l=50&s1=6981700.PN.&OS=PN/6981700&RS=PN/6981700. Arimaa does not disclose any material published in Chess Variant Page, yet appears to have drawn on ideas from other CV inventors [each individual responsible for own work]. Moreover, some referenced patent documents would seem to be irrelevant. It's reasonable over-all to patent this usp6981700 as unique, but the novelty is not quite honestly disclosed in the description. Since Arimaa by Variantists' high standards is subpar CV and game anyway, this critique will be intermittently developed. Some AI articles constantly kneejerk referencing Arimaa as landmark drone without rigour, and their authors unschooled in CVs should be embarrassed. http://en.wikipedia.org/wiki/Arimaa. Like as just one example, Carrera-Bird-Capablanca-Seirawan BN and RN compounds are periodically returned to as topic, to the extent Arimaa continues to be overplayed in Chess press undeservedly, the critiques will revive and deepen. Warp Point, http://www.chessvariants.org/diffmove.dir/warp-point-chess.html, was invented in connection with CVPage April 2002. This CVPage article says Arimaa was invented around 2002. Arimaa USA Patent has filing date October 3, 2003 and priority date October 3, 2002: http://www.patentbuddy.com/Patent/6981700. That would indicate Arimaa is invented fall or winter 2002-2003. Though not unprecedented Warp Points are unusual in CVs, and they do have functionality related to later Arimaa Traps. Unfortunately Omar Syed has never spoken here about Chessic influences and input, but arimaa sites tell of distress over 1996 Deep Blue-Kasparov match prompting new design. http://www.chessvariants.org/large.dir/contest84/transporterchess.html -- Transporter squares, four of them, were November 2002 in another CV. 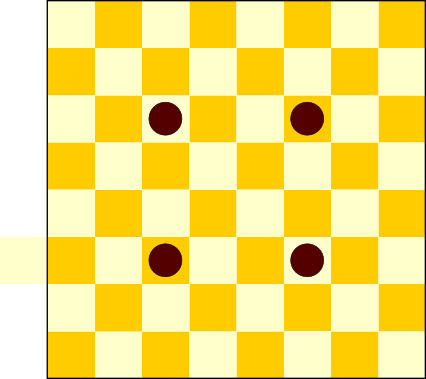 In 1996 Transporters, http://www.chessvariants.org/dpieces.dir/transport.html, one per side, move one step, the same as all the pieces in arimaa. Follow-up will look at prior art the patent itself cites. Also to locate are CVs where multiple movements, two or more, in one turn get distributed over two or more p-ts. Author: Hans L. Bodlaender. Inventor: Omar Syed and Aamir Syed.